The REEL Splint’s versatility can be the remedy to the common problem of a patient’s position of comfort and function not aligning with the splinting equipment provided by employers. The MedStar Mobile Healthcare System in the Fort Worth, Texas area covers 421 square miles of service area, with 350 employees running in a P/B configuration and responding to more than 112,000 calls for service annually. With a regional authority model consisting of a six-member board of directors, who provide policy oversight, and a 14-member board of medical doctors, who provide clinical oversight and direction, MedStar is in a position to rapidly evaluate differing treatment modalities for a wide variety of illness and injury scenarios. As with many EMS agencies across the world, MedStar’s EMTs and medics often found themselves facing orthopedic injury mechanisms which simply didn’t “fit” the available equipment on board their trucks, including angulated or displaced fractures, unstable joint injuries, crush injury, and more. Immobilization in the position found, while retaining the position of function, was challenging at best given the limited orientation of the traditional splinting materials (ladder splints, SAM-type splints, and improvised, for example). Since a great deal of EMS is about preserving function in the long-term by providing the correct care in the immediate aftermath of a patient’s injury, MedStar was open to looking around at different options on the market which better addressed the complicated positioning and stabilization needs of atypical extremity injuries. By finding a solution, their staff would better be able to prevent disability in both the short- and long-term sense, and reduce pain, for their patients stricken with that injury type. In 2004, MedStar’s clinical advisors came across a radically innovative solution to this problem: the REEL Splint immobilization and traction device. As Matt Zavadsky, Sean Burton, and John Elder of MedStar related in their interview with EMS1, several potential benefits became immediately evident upon looking over the device. 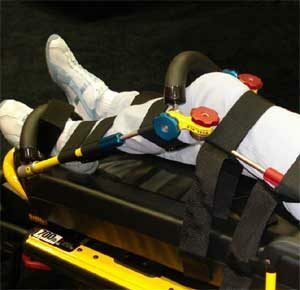 The first, as John says, was that the wide variety of lockable configurations inherent in the splint’s design, along with the built-in capability of functioning as a more traditional traction splint, meant that their EMTs and medics could carry something which would have not only greater functionality as compared to traditional splints, but would also be more efficient and reduce the amount of equipment which each truck needed to carry. Paul Martin of REEL Splint adds that this is a consideration for a lot of adopters, and adds as well the fact that carrying the device often cuts down drastically on consumable supplies for splinting, a significant cost for many ambulance services, simply because the durable, versatile, cleanable nature of the splint allows for a reduction in the volume of disposable splinting material. After implementing the splint across all of their vehicles shortly after purchasing them, stories began to come in of patient cases in which the splint provided a better outcome for the patient, along with much easier handling of the injury by their personnel. John relates one story of a patient that he treated with a complex humeral fracture which presented with the patient’s arm elevated above the shoulder, normally very difficult to immobilize for even the most experienced EMT or medic. Since he had the REEL Splint on board, however, he was able to match the shape of the splint to the injured arm, lock it into place after securing it around the injury site, and then, due to the handles present on the device, actually secure the entire extremity (via the splint) to the upper bar of the cot, with the result being both excellent immobilization and a reduction in pain for the patient. Matt and Sean also tell the stories of a couple of other uses of the device on calls that they did, including a dislocated, angulated knee in which the REEL Splint’s flexibility allowed immobilization with both comfort for the patient and retention of distal CSM, as well as another case where it was used as a more traditional traction splint with the included ratcheting strap-and-hitch system (familiar to everyone who’s ever worked in the field, but with a much higher quality of construction in the materials). Overall, response to the device has been very favorable among the staff of MedStar, says Matt, especially since training on its wide variety of uses is not only part of their initial employee orientation, but also is part of a larger skills-refresher course undertaken annually with all equipment carried on each ambulance. This ensures that their personnel are comfortable with how to use the device, and aware of its options for adjustment. The device is being used, on average, about once a month, perhaps not a high number at face value, but worth considering in that those patients are very likely those at the highest risk of permanent disability, and the use of the splint may have prevented that for many of them. One of the key benefits to being in a regional control-type system for EMS is that the implementation of best practices drives research, and not just the other way around, as is the case in many systems. MedStar’s flexibility and the intimate involvement of their medical advisory board means that they, like others in similar systems, can adopt the best possible practices very early on, and see how those practices play out in real life as they are refined. In this case, the adoption of the REEL Splint followed that model, and the results have been excellent for all concerned, from provider to patient and beyond. Greg Bogosian is the Special Projects Manager for the Praetorian Group, Inc. and is an 11-year field EMT-Basic with significant 911 system experience in urban and suburban patient populations.